Even though I knew we’d have more snow this week (and we did! 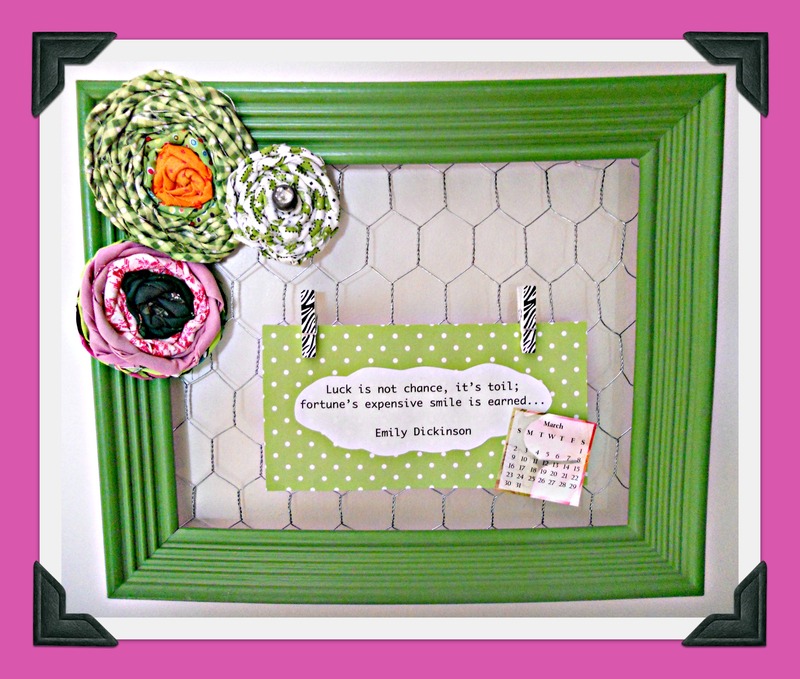 ), I had a free day on Saturday so I went ahead and dressed our home for spring, including a new GREEN Shantilly frame! For March, I found a thought-provoking Emily Dickinson quote about luck, snipped a tiny calendar from a bookmark in a Better Homes and Gardens mailer, and made some rolled fabric rosettes (from this tutorial, only stitched instead of glued). Happy *almost* spring! ♥ P.S. Here are the red frame restyles for November, December, January, and February. Beautiful! You are so ahead of the game! I probably won’t get my March pillow out until mid-March. I should do it right now beings that I still have the November pillow out, ha! So am I! I especially miss going for walks when the streets are all snowy and slushy . . . but I should be able to do that by end of week! Honestly, I think you have the makings now of an annual calendar. You’ve got several months all lined up to go. I’ve alraedy added a few shamrocks to my decor…NO MORE HEARTS!…light and airy! Seems I’m not the only one that has had enough of the cold! I really like your “Spring” offering. Did you purchase more than one of the frames? I seem to remember the last featured one was red…..or was it black. My mind is deserting me. Anyway, I like your fabric flowers and your readiness for spring. I’m looking forward to your upcoming monthly treats with these frames and your creative interpretation of what the month means to you. These are very enjoyable. You have inspired me to start decorating for spring. This year I will have to work from the inside out …. Brrrrr! I love the idea of attaching a quote for each month. 20 more days until Spring! You have one in green too!!! I love the quote. Gonna have to find my box of frames. That looks like so much fun to do them in several colors. Love this! March is the green month! lets hope spring comes soon… more snow this weekend! I love this color! I’m soooo ready for spring too!